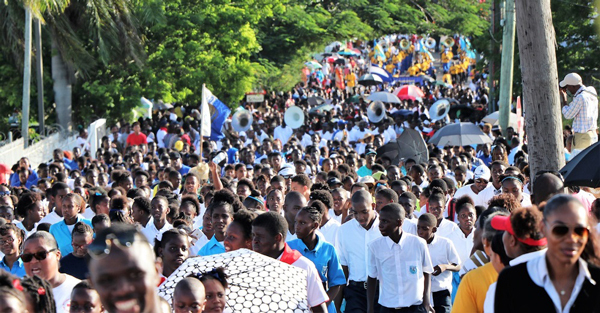 Nassau, October 9, 2018 – Bahamas – Under the current year’s theme “Youth: Forefront of Change”, thousands of young people and youth leaders representing about 50 youth organizations and schools participated in the 2018 Ministry of Youth, Sports and Culture’s National Youth Month March and Rally, on October 7, 2018. Among those joining them on the march from Clifford Park and through parts of Nassau were Minister of Youth, Sports and Culture the Hon. Lanisha Rolle (pictured addressing the crowd); Acting Permanent Secretary Rhoda Jackson; Acting Deputy Permanent Secretary and Director of Youth, K. Darron Turnquest; National Lifetime Award recipient and Youth Month Patron Elma Garraway, MBE; Member of Parliament Travis L. Robinson; Senator Jennifer Isaacs-Dotson; Senior Youth Officer John Darville; 2018 Miss World Bahamas Brinique Gibson; and stakeholders from various uniformed, church and civic organizations.